Product #21990 | SKU AH-ZED-14 | 0.0 (no ratings yet) Thanks for your rating! The Allen and Heath ZED-14 Mixing Console is a flexible, compact mixing desk for today's home studio, project recording and small live sound reinforcement applications. 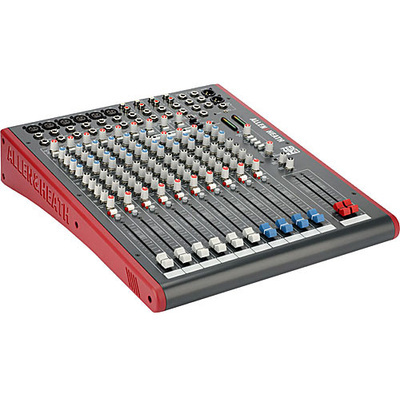 The ZED-14 features 14 inputs comprised of 6-mono and 4-stereo channels. The mono inputs provide high-quality microphone preamps and three-band AEQ. The ZED-14 features a USB connector for direct integration with Mac and Windows computers and a copy of Sonar LE recording software is included. A USB connection provides direct connection to Mac and Windows computers. Sonar LE recording software is also included. There are six mono channels with line and microphone input connections. The four stereo channels feature stereo-paired 1/4" phone connectors for stereo devices such as recorders, effects, keyboards, etc. All mono channels feature a 3-band AEQ with sweepable mid-range. The stereo channels feature 2-band AEQ. Inserts on all mono channels and stereo output provide flexible routing and control to outboard processors, effects, monitors, etc. The main output section feature a pair of balanced XLR connectors.